Whilst waiting to see what Kate chooses to wear next, the fashionable reporters over at Grazia have given us a glimpse into how the Duchess would look in this seasons most stunning pieces. The first mock-up that caught my eye featured Kate wearing red, by designers Roland Mouret and Antonio Berardi. Obviously Kate would opt to wear these in a more conservative manner, I think red is really her colour. Kate is joined by actress Carey Mulligan wearing Roland Mouret. 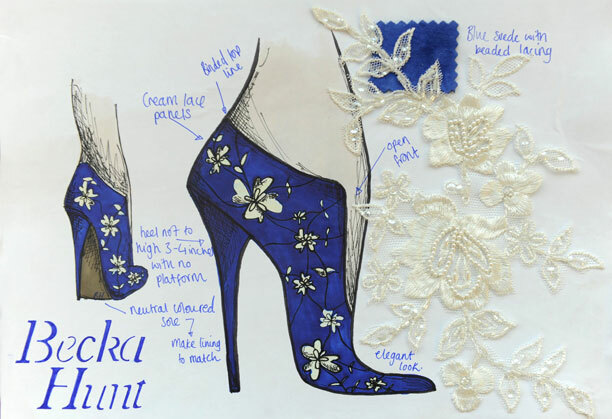 During the Royal visit to Leicester Kate judged several pairs of shoes created by students at De Montfort University and selected a pair of blue suede shoes covered in lace and delicate beading by design student Becka Hunt. To really show off the shoes while staying true to her classic style, a white dress would be the ideal choice. Below we see Kate wearing Andrew Gn, Blumarine and Erdem. Kate looked beautiful in Calgary wearing a primrose yellow Jenny Packham dress. Will we see her wear yellow again this summer? Below we see Kate looking trendy in Mulberry, Erdem and Burberry. I simply love the lace Erdem not sure the other two would be to Kate's taste. 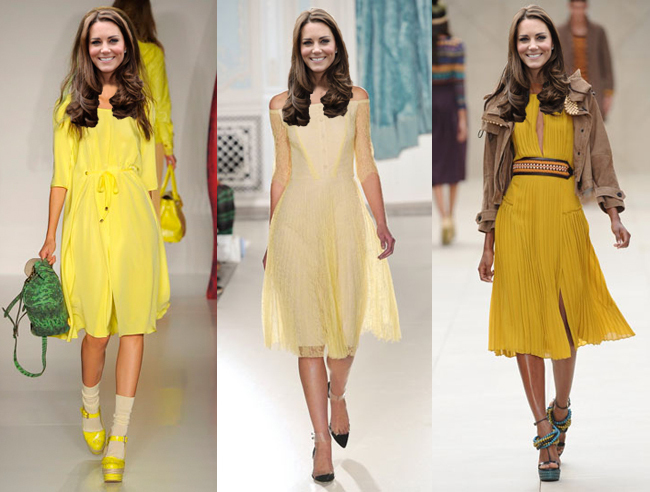 Which of these looks would you like to see Duchess Kate wear? The Treasury of the British Virgin Islands have launched two new coins to mark the thirtieth birthdays and first wedding anniversary of William and Kate. The coins which are struck by the Pobjoy mint in the UK and carry informal portraits of the couple in their evening wedding attire. We see Kate wearing her Sarah Burton satin gown with a soft angora cardigan. 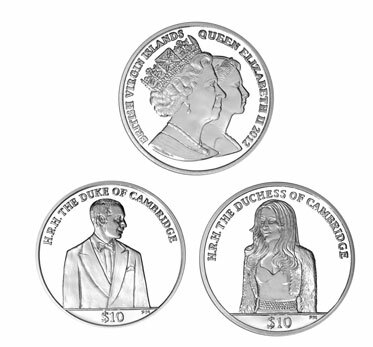 The site also features coins commemorating Her Majesty's diamond jubilee. If you wish to find out more about the coins or purchase them please Click here. Duchess Kate's sartorial choices have been revitalising British fashion and now front of house staff at Kate's London home, Kensington Palace are following in her footsteps. The new uniforms designed by Jaeger were unveiled as part of the royal residence's £12 million transformation. 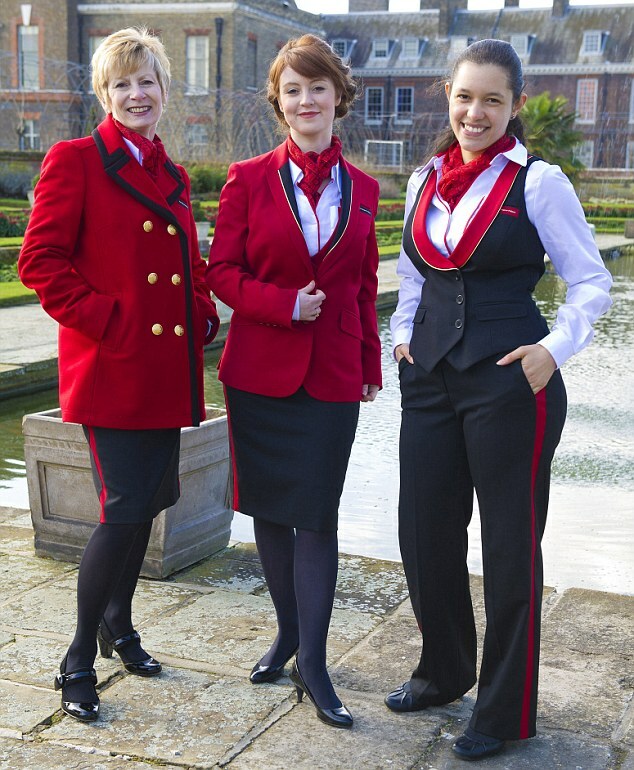 The 128 year old firm created bright red, double breasted blazers teamed with black trousers and knee length skirts. "I have been inspired by centuries of royal and court style and married this with modernity to offer the palace staff a bespoke uniform that they can feel proud of and enjoy wearing." What are your thoughts on the designer uniforms? Prince Harry recently completed his celebrated royal tour in Brazil. During his time there he candidly spoke about his sister Kate and Olympic plans. "The Three of us, my brother and my sister, will be as involved in the Olympics as we can be. I thought you were going to ask me if Kate was giving me fashion tips! She's not giving me tips yet." I thought it a truly touching comment by Harry. No doubt Kate also think of the Prince as a brother. Looking forward to seeing future jubilee engagement with William, Harry and Kate. 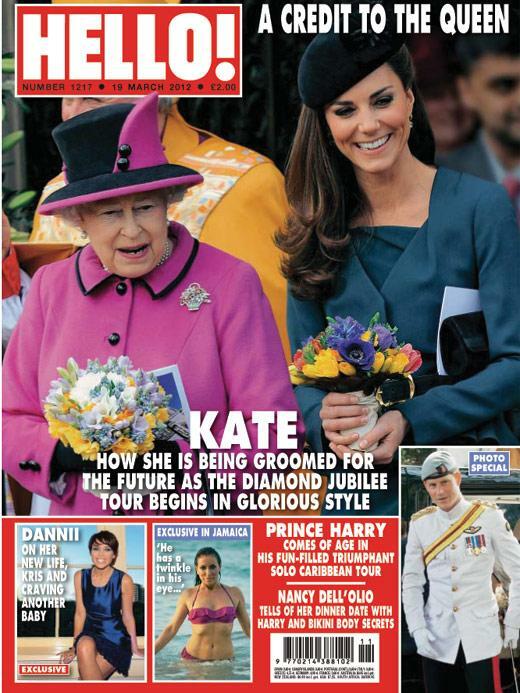 Kate and the Queen feature on the current cover of Hello magazine. I like the color of the uniforms, but the middle and right uniforms look like something an airline attendant would wear. so I'm really not sure about them. Love the first red outfit by Mouret! I think she'd rock that outfit! I really like some of the dresses here. I can see the Duchess wearing some of them with small adjustments. The new uniforms are nice. 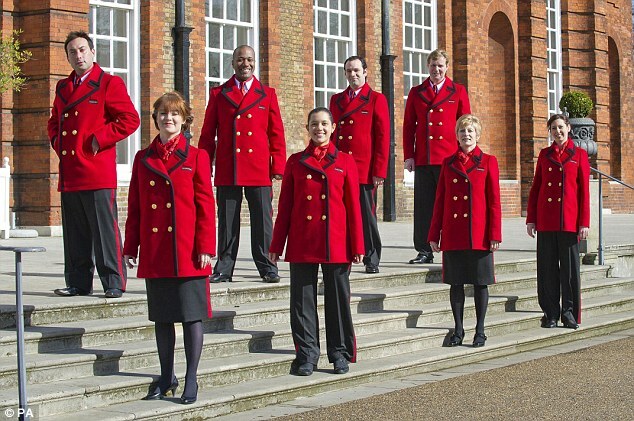 Are they for the staff that will be working for the Duchess & her Prince when they move into their new home in 2013? Did the Duchess have anything to do with the design? But if William stays in the military they might not be full time living in their new place. And we know that the Duchess & her Prince do not want any staff when they are living away from London. Charlotte thansk for all the great updates and I can't wait until Thursday. Pauline - They are front of house staff shown so I assume working witihin proximity of William and Kate whilst not personally working for them. Kate did not have anything to do with the designing of the uniforms. I heard William may not be back by the 19th, not confirmed though. Abby - I adore the red too, so pretty. I just have to comment on the Becka Hunt blue shoe design that Kate choose at De Montfort University. The design on paper looks beautiful however the photos I have seen of Becka holding the actual shoe does not look anything like the design. The lace is completely different, I'm rather disappointed. 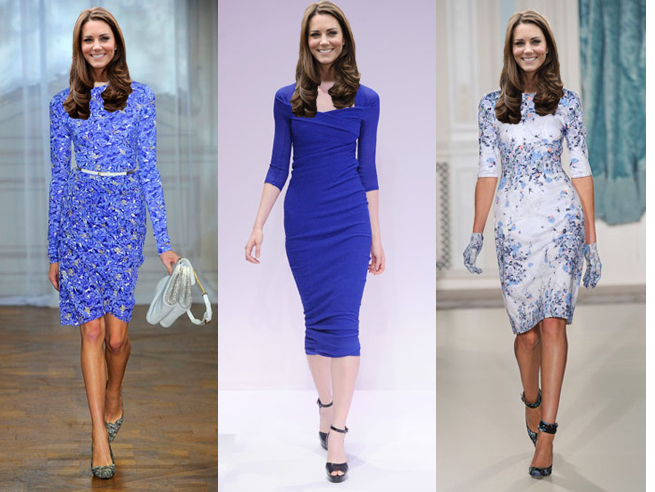 Anyway I suspect we will see Kate wear them sooner rather than later, probably with a blue outfit. Awesome designer dresses shown above. uniform is also very good. 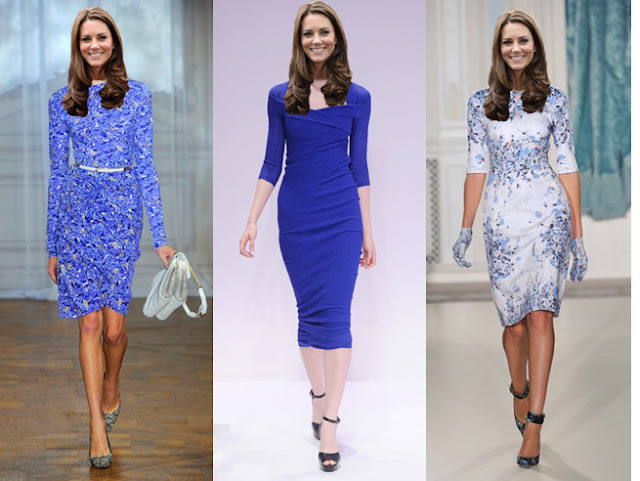 Kate look very pretty in the blue outfit. Do you know if it is a morning or evening engagement? I love the red suit and I'd like to see Kate try the long pencil skirt style. She could really pull it off. The blue dresses are also lovely. To be honest, I don't care for the new uniforms. SOME elements are okay but it all adds up to an over-done flight attendant look. I love seeing Kate "wearing" all these outfits. I think my favorite is the red suit. I think she needs to wear white with her blue shoes because they are so fancy that they don't need anything competing. I can't wait to see what Kate wears tomorrow at her function with Prince Charles & Camilla. Any idea what became of these blue suede and lace shoes designed for the Duchess?